For a map of the area, courtesy of the City of Port Orchard, see below. Proponents have strategy to extend the deadline for approval of the annexation petition. 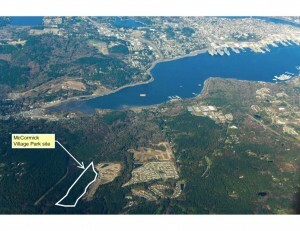 Proponents of an annexation on the Bethel Corridor that would bring 387 parcels of property into the City of Port Orchard have not given up their plan, even though the original six month deadline for collecting signatures on the annexation petition has come and gone. Joining the city would give property owners within South Kitsap’s main commercial thoroughfare the advantage of urban level services, said Gary Anderson of Kitsap Commercial Group. The city stands to gain increased revenue from the annexation, which includes the Safeway shopping complex at the corner of Bethel Avenue and Tremont Street, Walmart and the site of a future Home Depot. The city has already annexed the Fred Meyer shopping complex at the south end of the corridor, as well as other properties at the intersection of Bethel Avenue and Sedgwick Road. The total assessed value of properties within the 555-acre annexation area is $145 million. Property owners representing at least 60 percent of the total value must sign the petition for the annexation to move forward. Proponents have a six-month window within which to gather the required number of signatures. The total assessed value represented by signatures collected to date is 53 percent, a mere 7 percentage points shy of the goal. The earliest signatures on the petition are dated July 29. Although the six-month deadline is up, Anderson and others leading the annexation campaign have a strategy for staying in the game. According to City Attorney Greg Jacoby, signatures older than sixth months are automatically invalid. However, nothing prevents those property owners from signing again. Anderson’s plan is to revisit those who signed early in the campaign and ask them to sign again, with the new date recorded as the legal date of signing. Once the 60 percent threshold has been met, as long as all signatures are within a six month time frame, the petition is valid in favor of annexation. The total assessed value required is just more than $87 million. So far just more than $77 million is accounted for (including signatures that are more than six months old). “Trying to get that last 10 percent is always the toughest,” said Anderson. Large retailers that have signed include Safeway and Rite Aid, Anderson said. Walmart and Home Depot are in the midst of processing permits with the county, and so have not signed. According to Anderson, representatives of those companies have said they’re not opposed to annexation but leery of affecting the permit process. If the annexation is approved, the Walmart and Home Depot properties would become part of the city regardless of if they’ve signed, because they are within annexation boundaries. The city will hold public hearings forums on two pending annexations on both Monday and Tuesday. The Planning Commission will meet at 7 p.m. Monday. On its agenda is the McCormick Woods Annexation and the Geiger Road Annexation, in the vicinity of the intersection of Sedgwick Road (Highway 160) and Geiger Road east of Highway 16. The City Council will meet at 7 p.m. Tuesday to follow up with public hearings on both annexations. The Geiger annexation is related to the Bethel-Sedgwick Road Annexation approved in February by the City Council. The Bethel Road annexation involves 39 properties worth a combined $42.4 million, including Fred Meyer, valued at $19.2 million, and representing about 45 percent of the total. The Bethel-Sedgwick annexation will be final March 29. The Planning Commission will also discuss the Sidney & Sedgwick Corridor Sub-Area Plan. The City Council will meet at 7 p.m. Tuesday to follow up with public hearings on both annexations. Garrido, at the work study meeting, said the county is concerned about the way annexation along the Bethel-Sedgwick corridor is progressing. The county recognizes the city as the appropriate jurisdiction to eventually serve the Bethel-Sedgwick corridor. But with annexations occurring piecemeal along the corridor, the Kitsap County Sheriff’s office and public works departments are running into some confusion and difficulty serving the area, Garrido said. The city has so far taken the approach of waiting for property owners to take the lead on annexation. There has been some talk among city officials of running a ballot measure that would allow the city to annex the entire urban growth area at once. At the meeting, City Attorney Greg Jacoby asked if the council would be interested in drafting a policy to define the boundaries of the area it wishes to annex. The alternative would be to remain with the property-owner driven method of annexation, Jacoby said. The city has been approached by property owners in a large portion of Bethel Road, identified as the Bethel Corridor North annexation. If and when these parcels become part of the city, Port Orchard would have jurisdiction over the the entire Bethel Corridor from current city limits to just beyond Sedgwick Road. Other city council members, including John Clauson and Fred Olin, expressed eagerness to annex Bethel North and as much of the rest of the city’s urban growth area as possible. “Citizens don’t know where we stop and the city starts,” Garrido said. Coppola responded by criticizing the county for its lack of progress on the Bethel Corridor Plan. The cost of widening the road to accommodate current and future traffic in South Kitsap’s main commercial area has risen to $43 million since 2000, when the Bethel Corridor Plan was adopted by the county’s board of commissioners. The county has spent $1.8 million out of its road fund on design and permitting, but the project is essentially at a standstill. A survey conducted by the county last year showed a lack of public support for a special taxing district or other taxing mechanisms to pay for it. Coppola said Port Orchard has been trying to work with the county, but city officials are chafing at the delay on improving an area critical to the city’s economic development. John Clauson said the Bethel Annexation shouldn’t be made the “poster child” for annexations gone awry, when the interlocal agreement between the county and Kitsap cities – drafted about a decade ago in anticipation of annexations happening now – is proving vague on exactly what a smooth transition is supposed to look like. Clauson suggested that the Kitsap Regional Coordinating Council, which includes all cities and the county, should look take a big picture look at annexations and the interlocal agreement. Part of the agreement calls for revenue sharing between jurisdictions for the first three years, with the city receiving 25 percent of sales tax revenue the first year, 50 percent the second and 75 percent the third. The purpose is to allow the county to make a gradual fiscal adjustment to the loss of revenue. “From what we see, it’s going to cost us money to annex, but it’s what we’re supposed to be doing,” Clauson said. But where McCormick Woods is almost entirely residential, the Bethel Corridor is mostly retail, including the heavy hitting Fred Meyer and Walmart, with Home Depot to come. Loss of revenue from the area is sure to hit the already fiscally challenged county where it hurts, not matter how gradually it happens. Councilman Rob Puutaansuu, who is on the city’s utility committee, addressed that issue, saying business owners along the Bethel Corridor have come to the city anxious to receive an “urban level of services.” He said the city will not just cherry pick the lucrative businesses on the corridor but will “do the right thing” and welcome residential property owners in the area surrounding the Bethel Corridor and beyond. Garrido said she has approached state and federal legislators seeking federal stimulus money for the Bethel Corridor, which was not on the Puget Sound Regional Coordinating Council’s recommended list of projects for initial transportations stimulus funding. Over at the Caucus blog we’ve got a little ditty about SKIA anexation. You might not be surprised to hear that I’m seeing slightly different characterizations from Port Orchard and Bremerton. The official word from the board, for now, is the annexation of the northern property was accepted as submitted. A written decision will be issued later this month.